Minnesota is a national leader in ethanol policy and development. In 2005, Minnesota passed an aggressive law that requires all gasoline sold in the state to contain 10% ethanol. The amount of ethanol blended into gasoline will increase to 20% in 2013. Minnesota currently leads the nation with more than 350 commercial E85 stations available to consumers. This aggressive plan has benefited many economic industries across the state, including agriculture, manufacturing, transportation, services, construction and trade. In 2009, the Minnesota ethanol industry generated a total economic impact of approximately $2.5 billion and more than 6,800 jobs. The combined impact of Minnesota’s corn and ethanol industries surpassed more than $12 billion and more than 70,000 jobs in 2007. Ethanol, also known as grain alcohol or ethyl alcohol, is a clear, colorless liquid alcohol often produced by fermenting starches. In Minnesota, ethanol-gasoline blends such as E10 and E85 are produced from corn, but other starch crops may be used for production. Ethanol is a valuable and sustainable alternative to petroleum-based transportation fuels. 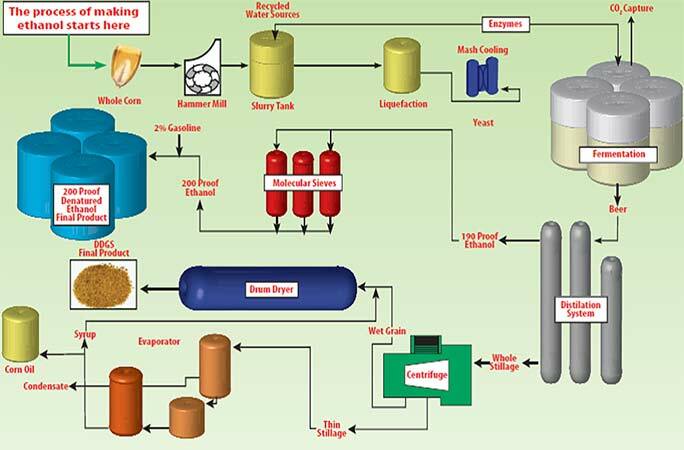 While the basic steps remain the same, the ethanol production process has been considerably refined in recent years, leading to a very efficient process. There are two production processes: wet milling and dry milling. The main difference between the two is in the initial treatment of the grain. The Al-Corn plant in Claremont dry mills corn. Companies are also using biomass gasification and methane digesters to reduce natural gas consumption. Additional work is being done to reduce energy consumption and production costs, increase efficiency and reduce emissions using the best available control technologies. The Al-Corn plant has reduced water consumption to less than 2.5 gallons of water per gallon of ethanol and has eliminated liquid discharge. In addition, energy conservation efforts have reduced the plant’s energy use by more than 25% compared to the original plant design. Minnesota is the fourth largest producer of ethanol in the U.S. There are 200 ethanol plants in the U.S. and they converted 3.8 billion bushels of corn into more than 10.6 billion gallons of renewable ethanol in 2009. New technologies allow ethanol producers to capture and output products such as corn oil, recoverable carbon dioxide, corn syrup and bio-based chemicals — all of which add value to the plant beyond the traditional output of feed and fuel. One bushel of corn yields about 2.8 gallons of ethanol. Dairy cattle, swine and poultry industries are benefiting from a diet supplemented with high protein, nutrient-rich distillers grains, displacing the need for corn and soybean meal. One third of every bushel of corn used for ethanol is returned to the feed market. Ethanol production consumed about 21% of the nation’s total corn supply in 2009. In 2009, the production of ethanol helped support nearly 400,000 jobs in all sectors of the economy. A typical 40 million gallon ethanol plant creates 32 full-time jobs and generates an additional $1.2 million in tax revenue for a community. The U.S. Department of Energy estimates that for every 1 billion gallons of ethanol produced, 10,000-20,000 jobs will be added. In 2009, ethanol production contributed $53.3 billion to the nation’s Gross Domestic Product (GDP). Studies show ethanol reduces greenhouse gas emissions between 59-61% compared to gasoline. The use of 10.6 billion gallons of ethanol in 2009 reduced greenhouse gas emissions from vehicles by 16.5 million metric tons, the equivalent of removing 2.7 million vehicles from the road. One acre of corn can produce enough ethanol to run a car for some 72,000 miles on E10 Unleaded. For every barrel of ethanol produced, 1.2 barrels of petroleum are displaced. There are some 7 million “flexible fuel” vehicles on America’s highways that can run on up to 85% ethanol (E85). A flexible fuel vehicle can run on any combination of gasoline and ethanol up to 85% ethanol. You can fill up with E85 one time, E10 Unleaded the next and ordinary unleaded the next (a computer in the vehicle fuel system automatically adjusts for the level of ethanol in the fuel mix). View up-to-date USDA calculations for month of delivery, cash price, futures price, change and basis. Cash-bids are subject to change without notice. No Early Corn Delivery. Closed Saturday and Sunday. Al-Corn Clean Fuel will NOT ACCEPT any varieties of corn that are not approved for U.S. export. Ethanol, also known as grain alcohol or ethyl alcohol, is a clear, colorless liquid alcohol often produced by fermenting starches. ©2017 Al-Corn Clean Fuel, All Rights Reserved. Dry milling – The whole corn kernel is ground into a powder, mixed with water to form a mash (similar to oatmeal) and then cooked with enzymes that turn the starch into glucose. The mash is fermented and distilled to separate the ethanol from the solids and water, which becomes a high quality livestock feed called distillers grains. Many Minnesota plants also produce carbon dioxide, which is used for refrigeration or as an industrial chemical. Dry milling is the most commonly used method in Minnesota. Wet milling – Corn is steeped in water and sulfur dioxide before grinding, then the germ, fiber, gluten and starch components are separated. The starch can be sold for use in food processing, paper milling and other uses, or, it can be further processed into corn syrup, ethanol, amino acids or a wide variety of other products. The germ, fiber and gluten can be made into corn oil, livestock feed and many other products.